Confession: I love quick turnovers....for me it's the ultimate challenge. To solve an assignment conceptually, sketches and final art, all in a mere three hours. For better, or worse, it has become my niche. I think I was a two bit gunslinger in my former life. When it gets hairy is when the image is packed with visual elements, sometimes integral to the image, sometimes at the behest of a non visual editor who fears the message will not be clear unless we hit them over the head with the kitchen sink. I always fight for the integrity of the image...the freshest concept. Where I will compromise is on the minutiae. An extra sign here, a condo there. When the clock is like a ticking time bomb, I set up the execution of the final art like a Zen experience. On goes John Coltraine (this time) and I get into a comfortable groove.... find the meter to carry me through when there are no allowances for a clumsy brushstroke, or a badly rendered alligator foot. Then it's just me and "the white bull". The world at large slips away and the paper is mine to stain with something beautiful, or odious. Nice job man! I know what you mean about quick turnarounds and lots of detail. I usually try to go with something "simple and graphic"! You always amaze me, as a artist and fast artist too! 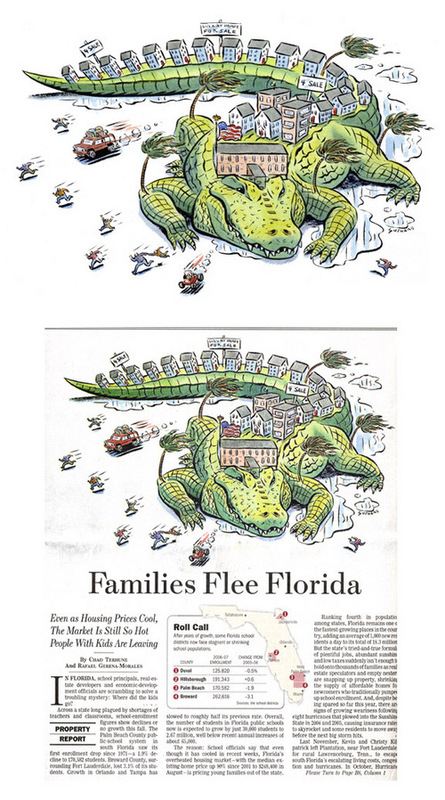 What was the reason the article said people are leaving Florida (the hurricanes)?